Sometimes it takes a little more than a green juice to get me going. Especially after a night of wine drinking & disco dancing. I love to bake on the weekends, & a basket of fresh strawberries from my CSA were calling to me… “make vegan strawberry muffins.” So I did just that this past Sunday. I also love to have a little something sweet with my weekday morning coffee or tea. It takes the hunger edge off while I am getting ready for work. I get up super early, too early for breakfast which I “drink” on the go, but not too early for a little pre-breakfast treat. I adapted this recipe slightly. Lately I’ve been loving baking with coconut oil so I used that in place of the canola oil. I love the mild flavor & light texture coconut oil imparts. Keeping with the coconut theme, I used coconut milk (from the carton, not can) in place of soy milk. Strawberries + Coconut = Instant Tropical Getaway for the Tastebuds! Preheat oven to 375. Prepare your pan with muffin cups. Add all dry ingredients to a bowl & mix. Add the milk, oil and vanilla to the dry ingredients. Don’t over mix the batter. It’s a bit thick & sticky, similar to dough. Fold in strawberries. Spoon the batter into muffin papers. Bake for 15 to 18 minutes. When you take them out, let them cool for 10 to 15 minutes before you remove them from the pan. 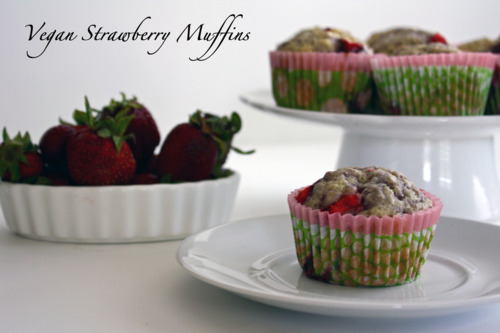 These muffins are light & fluffy, & slightly sweet with a hint of coconut & lots of gooey strawberry goodness. I hop you enjoy these super yummy morning delights.